They call themselves the Leopardi Circle--six members of a writing group who share much more than their works in progress. When Nancy, whose most recently published work is a medical newsletter, is asked to join a writing group made up of established writers, she accepts, warily. She's not at all certain that her novel is good enough for the company she'll be keeping. Her novel is a subject very close to her heart, and she isn't sure she wants to share it with others, let alone the world. But Nancy soon finds herself as caught up in the group's personal lives as she is with their writing. She learns that nothing--love, family, loyalty--is sacred or certain. 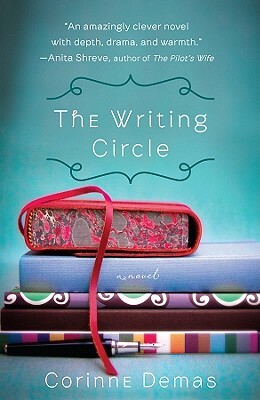 In the circle there's Gillian, a beautiful, scheming, world-famous poet; Bernard, a pompous but lovable biographer; Virginia, a respected historian and the peacemaker of the group, who also happens to be Bernard's ex-wife; Chris, a divorced father and successful thriller writer; and Adam, the youngest of the group, an aspiring novelist who is infatuated with Gillian. And then there's Nancy, an unassuming fiction writer embarking on a new chapter in her own life. They meet to read their work aloud and offer feedback. Over the course of a year, marriages are tested, affairs begin, and trust is broken. Corinne Demas is the author of Eleven Stories High (SUNY Press), a memoir of growing up in Stuyvesant Town, and the short story collection What We Save for Last (Milkweed Press). Corinne has also written many books for children, including Saying Goodbye to Lulu (Little, Brown). She has been the recipient of a National Endowment for the Arts Creative Writing Fellowship as well as the Andrew W. Mellon Fellowship, and has won The Lawrence Foundation Prize for best story to appear in the Michigan Quarterly Review. In addition to writing, she is a Professor of English at Mount Holyoke College and is the Fiction Editor of the Massachusetts Review. She lives in MA and spends her summers on Cape Cod. "You find you simply can't put it down. This is a wonderful book, tense, engaging, and highly recommended."